A couple of months ago the lovely team from Begu Tea kindly sent me their range of healthy lifestyle teas. These aren't your normal pg tips kind of tea bags, they are "a revolutionary lifestyle and weight loss system, targeted and personalised to you. A first-of-its kind product". I love how Begu Tea have their own hashtag. There isn't many companies out there who create their own hashtag instead of a motto and I love this! #Begoodtoyou is a way of embracing and creating a more positive and healthy lifestyle. Begu explains if you have always wanted to become the new healthy you, struggled with a healthier lifestyle in the past or if you have current health ambitions or a weight-loss target then these teas are the perfect route for you! By carrying out a questionnaire, Begu will be able to tell you which tea you will benefit from the most based on your lifestyle choices; making this whole journey very personal! However, you will be given the option of three different teas which is what makes this journey even better; is there any other tea brand that does this? I don't think so. One aspect I love about Begu Tea is how they do not believe in how one tea is fit for everyone. I cannot stand a pg tips cup of tea, or any English tea for that matter. I find the tea bags smell incredible but as soon as they are in contact with water; they are grim! However, Begu Tea has changed this for me! I have loved all six of their teas which I was definitely not expecting. Begu Tea provides all of the natural herbs you could ever possibly find within tea plantations and they blend them and bag them together in biodegradable cute little pyramid bags! They're adorable. Something you also do not find in your standard pg tips is the cute paper tab on string which you hang on the side of your mug, so you can easily pull the teabag out if you do not have a spoon nearby! Although I do not drink the standard English tea, I do love seeing cups of tea which have these; I feel they make the world of difference to your afternoon tea! Begu Tea provides all of your tea bags into large sachets for each tea and on the back of these sachets you will find everything you need to know about these teas, even down to which exact herbs you will find in your individual tea bags. At the top of these sachets, I love, and I mean love how they have used a quote "Be good to me...seal me up to keep me fresh"; I just think this is so cute. As well as the ingredients for each tea included on the back of each sachet, you will also find the Origin of these teas, what the tea is for and how to use the tea. This may sound absolutely ridiculous "how to use a tea"; but some teas you can include milk in, whereas some of the teas you can't. I think this is very beneficial especially if you are new to drinking tea! You can find the full range of teas here! Crave – 28 Teabag Treats: Resist the urge! Give into your cravings and rewards yourself with a delicious sweet treat.RRP £24.99. Contains Caffeine. Calm – 28 Serene Teabags: Calm yourself! True tranquillity in a teabag to help you unwind and relax. Morning Buzz – 28 Lively Teabags: Crank up your calorie burn! A fresh and zesty taste, perfect to wake up to! Appetite – 28 Fulfilling Teabags: Cut down on big portions! A perfectly satisfying blend to help keep you going through the day. Nightea Night – 28 Sleepy Teabags: Boost sleep and body repair. A peaceful and relaxing brew to wind your day down. System Cleanse – 14 Day TeaCleanse: Reboot & settle your system.Reboot and settle your system! I absolutely love the shape of these teabags, how they are transparent so you can see exactly what is inside your teabag and how they are biodegradable too! Everything you need in a teabag are in these teabags and I cannot get enough of them! It may sound strange too, but they would be a lovely feature just to have on the side in a transparent jar for the world to see! They're so aesthetically pleasing! Each of these teas had a completely different taste to the next one I tried and they are all different in their own little way! I found crave tasted and smelt very much like honey and this made me want to drink it even more. Whereas in morning buzz, you could definitely taste the citrus' in there! There wasn't one tea which I didn't enjoy and they are now part of my day! On this note, I'm going to go make one! Of course I have to mention the little paper tab on string again! The paper tab on teabags represents the best of all teas! It's what makes a teabag in my eyes! (As well as the pyramid shape of course). This tiny little peace of paper has made my life so much easier while at work as I do not have to hunt for a spoon to scoop the teabag out while also running around trying to find different bits and bobs for each lesson! Life saver all around. 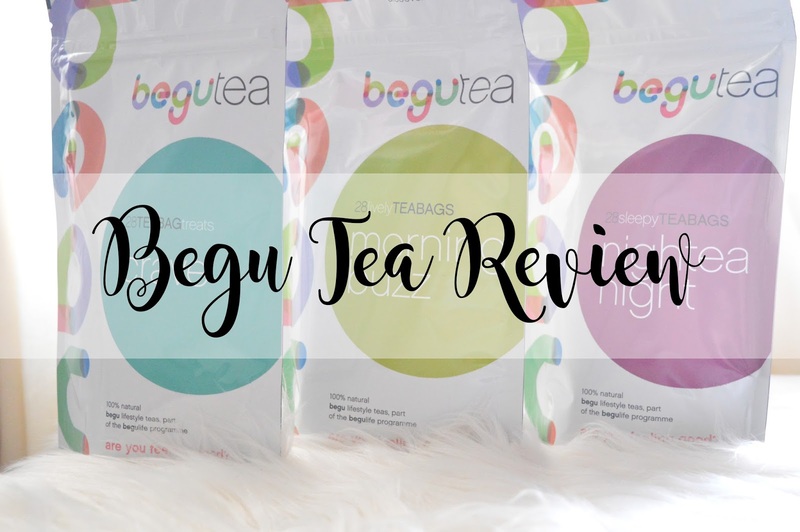 Thank you so much to Begu Tea for letting me try all of the teas and let you guys know what I think of them! I highly recommend checking them out if you're like me and cannot stand the taste of English tea! What do you drink first thing in the morning? A healthy lifestyle tea? English tea? Coffee? Or something completely different? Leave me a comment!